Another challenge I haven't played with for a long time is CAS-ual Fridays. This week's challenge is to use autumn colours and a leaf. I chose a leaf from Paper Smooches to create this lotus blossom of autumn colours, one of my favourite Michael's sentiments and a copper brad. It actually took an embarrassingly long time to make this card - when you're relying on stamping to be the focal point of your card, it's got to be placed in the right spot (I started with a much larger white panel and then cut it down bit by bit until I was happy with where it sat on the card) and it's got to be stamped perfectly - every little flaw becomes very, very visible! Here in Toronto, our leaves are just starting to turn. It's been a strangely cool and wet summer, so it will be interesting to see if that impacts the show of glorious-ness that we usually get in October. You always seem to perfectly hit that sweet spot with your focal points, Ardy, and there are never any flaws that I can see!! Love this! Oh my. This is just fabulously Ardyth! The layered ombre leaves look FABULOUS Ardyth! Well..the time was well spent Ardyth! This is a beauty! Ardyth this card is absolutely stunning! I always love your clean, graphic cards. Just so brilliant, another stunning card! That is stunning! The ombre leaves, the touch of brad, the placement. Everything's perfect and well worth the time and effort you spent! Love this! Gradient & graphic! A bouquet of fall leaves ... gorgeous! It's also very reminiscent of turkey feathers with these fall colors and the brad in the middle. I think this card would look just as good turned to the right (with the leaves on top and sentiment going sideways). Guess that's an indication of good design, right?! So glad to see you at CAS-ual Fridays! Wow Ardyth... So creative and bold. Awesome. What a great visual image those leaves are. And they pair so well with the big sentiment. Absolutely gorgeous card, Ardyth! I love how you stamped the leaf and your CAS design is stunning! Stunning results! It would appear that it was time well spent as you have once again produced a perfectly flawless creation! The ombre shades are so pretty. The copper brad really anchors the image! Absolutely stunning and brilliant in its simplicity! LOVE it, Ardyth! LOVE this! I knew it was yours as soon as I saw it among all the entries. It's simply perfect. Love this Ardyth! Perfect colours, stamping and proportions. This is amazing. This is brilliant. You are amazing. You are brilliant. Thanks so much for joining us over at CAS-ual Fridays! CAS isn't as easy as it would seem is true! 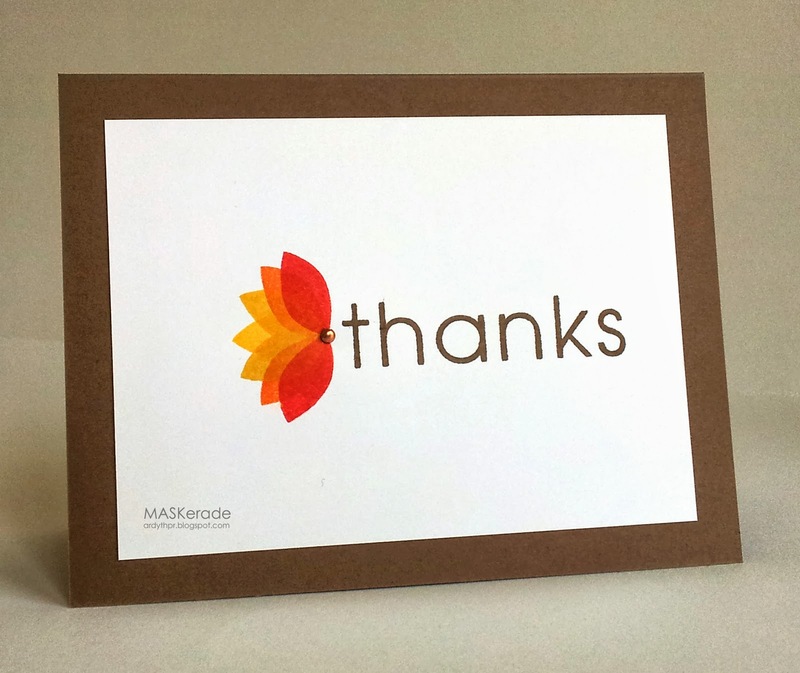 I am thinking turkey day for this autumn card! Perfectly stamped!